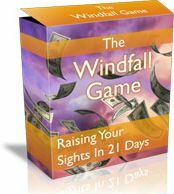 Thanks for Playing the Windfall Game! Welcome to the first day of a broader vision of yourself and the possibilities before you. Over the next three weeks, you will use "virtual" checks as a vehicle to explore (and expand) your assumptions and also your desires. You may be surprised at what you discover. You can access these checks in two ways, either by bookmarking the downloads page and proceeding at your own pace, or bywaiting for each of your reminder emails. In your mailbox, the sender will appear as "Lynda Edwards"; the subject line will usually read, "Your link to today's check."